What Was the First Company Offered on the New York Stock Exchange? The path of Wall Street was originally a wall running across lower Manhattan. 1. Is the New York Stock Exchange the Largest Stock Market in the World? 2. 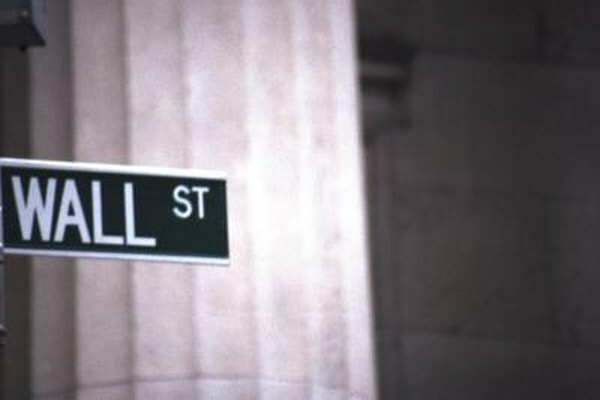 What Is the Opening Time for the New York Stock Exchange? 3. What Type of Market Is the NASDAQ? The New York Stock Exchange has become such a prominent part of modern life, it's hard to imagine a time when it didn't exist. However, it was created in lower Manhattan in the late 1700s. Before the first stock could be traded, investors had to agree on legalities and procedures. From the initial trade of shares of The Bank of New York, volume has grown to an average of 1.8 billion shares per day. Twenty-four New York stockbrokers and merchants met May 16, 1792 under a buttonwood tree at 68 Wall Street. They set up all the rules for buying and selling company stocks as well as bonds. These were the first members of what was called The New York Stock and Exchange Board. This event is now known as the Buttonwood Agreement. The original Buttonwood members drafted and signed a constitution for the organization in 1817. In 1863, the institution's name was condensed to what it is called now, the "New York Stock Exchange." Since 2007 it has been NYSE Euronext because of its merger with the European combined stock market. Though New York still claims to be the home of the exchange, it is actually a transatlantic organization. The bell you hear at the opening of each trading session has been trademarked "The Opening Bell." Celebrities and dignitaries are often invited to ring The Opening Bell to start the trading day. However, the original sound was a Chinese gong. The exchange switched to brass bells in 1903. Today there's a bell in each of the trading areas. Each trading day closes with a bell, which is trademarked as "The Closing Bell." The original company whose shares traded as The Bank of New York in 1792 is now the Bank of New York Mellon and is still fully operational in Manhattan. This bank traces its roots back to Alexander Hamilton, who wrote the bank's constitution and guided it through its first years. This is the oldest bank in America. Today the NYSE, which started with only one company, lists more than 8,000 companies. It trades more than 30 percent of the world's equities. The 24 traders who met under the buttonwood tree could not have imagined the worldwide electronic exchange that their original organization has become in barely 200 years. Though traders once crowded the floor of the exchange loudly announcing their trades, today's electronic trading allows traders worldwide to exchange stocks with the click of a button. The actual trading floor is relatively quiet. What Is Sensex in the Stock Market? What Are the Hours of Business for the New York Stock Exchange?